Homemade hot-wire cutter constructed from scrap materials. Powered by a 12V model train transformer. 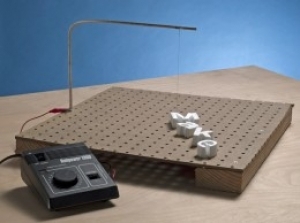 Pegboard tabletop is capable of accepting a range of cutting guides. This is very classy...I'd like one...someday.